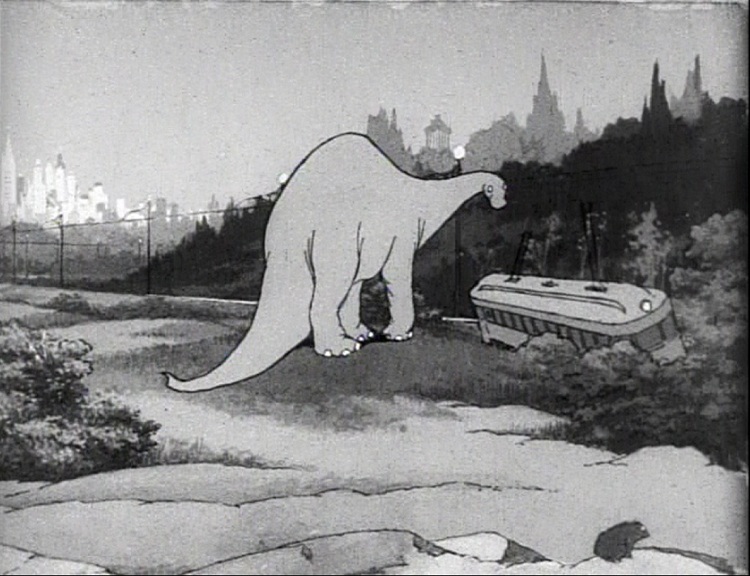 ‘Gertie on Tour’ is but a short fragment from an unfinished and unreleased film featuring the prehistoric star from ‘Gertie the Dinosaur‘ (1914). In this excerpt Gertie lives in the modern world: she plays with a frog and with a streetcar, then she dreams she’s back in the Mesozoic, dancing for her dinosaur friends. ‘Gertie On Tour’, like almost all sequels, cannot compare to the first film. Nevertheless, it’s nice to see slightly more footage of this sympathetic brontosaur. The dancing scene in particular catches her playful spirit. Like ‘The Centaurs‘, this short contains very beautiful and elaborate backgrounds, which, undoubtedly thanks to the invention of the cell, are a great improvement over the backgrounds in ‘Gertie The Dinosaur’, which had to be retraced over and over again for each single frame.